Based on the book, I got the impression that in public, Breitbart was an in-your-face, no holds barred communicator, but he revealed his behind the scenes insecurities as well, though I’m sure he didn’t overly disclose personal details. Although I could agree with him on the majority of his content, the depiction of the 2009 ACORN videos and James O’Keefe was disappointing. The book was published in 2011, but by June 14, 2010, ” the U.S. Government Accountability Office (GAO) published its report finding no evidence that ACORN, or any of its related organizations, had mishandled any of the $40 million in federal money which they had received in recent years.” (of course the source of that information is the Huffington Post and CNN, which I’m sure Breitbart wouldn’t consider objective reporters). There’s enough evidence to suggest that James O’Keefe and Hannah Giles heavily edited the contents of their numerous ACORN videos to mislead viewers into believing ACORN staffers were complicit in criminal activity. I was hoping that at the end of the chapter in which Breitbart chronicled these events, he’d admit that he’d been duped by O’Keefe and Giles, but he didn’t. In fact, he seemed to be saying that the “Leftist Media Complex” was responsible for pushing that “lie”. One thing I come away with after reading the book is the strong desire to sit down over coffee or a beer with Andrew Breitbart and get his views on the recent election and how the media has and still is crucifying Trump voters. I never will. 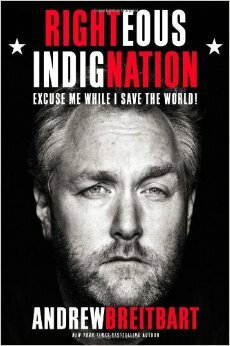 Breitbart died of heart failure on February 29, 2012 at the age of 43. He was obviously intelligent, passionate, well-read, and informed (not as a result of his university education, however, since he blew off that part of his life). If anything, I’d say he was a little too self-assured about his viewpoints because, after all, liberals can be honest and sincere, and conservatives can be up to no good as well as vice versa. I know that sounds paranoid and it’s possible that having just put down the book, my thoughts and language is somewhat influenced by Breitbart’s. I don’t think he was evil incarnate as probably many or most progressives believe. I don’t think (the ACORN videos aside) he was out to create a false image of the liberal “Complex”. I believe he was generally honest and sincere, if a bit myopic, and he really did see himself as the protector of Tea Party conservatives who were, and still are, under attack. Breitbart probably finished the authoring and most of the editing of his book in 2010 and it was published in April of 2011. Yet, the text above is a perfect description of how Trump voters and anyone who did not want Hillary Clinton to be President (even if they didn’t vote for or support Trump) are being treated in the news media as well as on university campuses and among the progressive elites right this very second. He only missed “deplorables” in the list of adjectives and only because he died four years before Hillary Clinton attached the term to conservatives. I’ll return the book to the library in a few days, but it’s one of those few books that I may purchase and add to my permanent personal library. The lessons he taught, which sadly ended with his death, are still far too relevant to what we are all having to live through today. I’m sorry I missed meeting you, Andrew. I’d love to know what you’d say and do today. For the record, “deplorable” was applied to about half of Trump supporters, not conservatives. I read how Clinton coined the term, but it does resonate with what Breitbart wrote in his book about how the media would label Tea Party conservatives and attempt to tarnish their reputations. The exact same thing is being continued with Trump supporters and anyone perceived to be a social or fiscal conservative (they are assumed to have voted for Trump, even if they didn’t). Firstly, I’m not a Breitbart devotee. I can think for myself and am sure I was a conservative before he was (almost before he was even born) — and I know the roots of the movement that clearly gained momentum in my day (the general paranoia on the part of tea party folks “on behalf of” conservatives is ridiculous in this light). Secondly, it is quite a curiosity that the tea baggers were angry at Barak Obama over the spending of money, angry like it was his fault directly at the end of an outrageous Republican administration. Irrational. Yes, there are racist elements. Nobody had to tell me this; I could see it. Breitbart, then more so Bannon and Trump, played up the race elements to their benefit. Oh, and “the Christmas” issues (what a bunch of bologna). Lewindowski says people can say “Merry Christmas” again because Trump was elected. Trump has taken credit for Christmas shopping. Trump likes to showboat and he’s an attention junkie. I’m not particularly concerned about Trump’s feelings, but I do believe Breitbart had a point about the severe bias of the news media, entertainment industry, and university system for progressives and against anything else. Just because someone doesn’t like Obama’s policies doesn’t make them a racist. I see what you did there. Sure. Why shouldn’t you ignore what is being said and what’s really happening? That is the game, after all. Actually, it’s something you should understand. unlike whatever arbitrarily isn’t to be addressed… those feelings, now we’re talking? Being racist because of disagreeing with Obama on something is my point? You’ve been well indoctrinated on not seeing apples for apples. It’s more like a black man saying “Merry Christmas” doesn’t look like anything. (See “Westworld.”) Therefore, since a so-called conservative didn’t see or hear it, it wasn’t there. And both McCain and Obama were (before either was elected in 2008) planning on the same kinds of measures to deal with the immediate aftermath of a disaster that was the George W. Bush presidency. Bush would have had to do the same as well. Passes for Bush and Trump abound. Greenspan, by the way, was also part of the financial meltdown (trusting/expecting rich people to do good, no need for safety rules). Anyway, I appreciate that you have allowed yourself to be informed that the propaganda against ACORN was edited tape, intended to fool (bearing false witness) — manufactured storyline that succeeded in putting an inner city organization (with images of black people) out of the running. It wasn’t the only time he got carried away with lies. It’s good you noticed Breitbart ended up seeming to blame the left. The tactic happens a lot. being a fan of his (as if lefties). Of course, they “crucify” liberals and moderates all the time, always have. An anonymous smear campaign began against McCain, delivered by push polls, faxes, e-mails, flyers, and audience plants. The smears claimed that McCain had fathered a black child out of wedlock (the McCains’ dark-skinned daughter was adopted from Bangladesh), that his wife Cindy was a drug addict, that he was a homosexual, and that he was a “Manchurian Candidate” who was either a traitor or mentally unstable from his North Vietnam POW days. The Bush campaign strongly denied any involvement with the attacks. McCain lost South Carolina on February 19, with 42 percent of the vote to Bush’s 53 percent, in part because Bush mobilized the state’s evangelical voters and outspent McCain. I meant to designate that quote as pertaining to the 2000 Republican primary season.